There’s been a bit of exciting weather this last week. And by exciting I mean different from what we usually get during this time of year. Normally it’s hot with clear skies, little to no wind, and humidity around 20%. Hot, dry, clear. Weeks go by with little variation other than if it will be 100 degrees, 105 degrees, 110 degrees, or merely 95 degrees. Last week we had a couple of thunderstorms pass through! We had actual rain and actual lightning right here. Thunderstorms are pretty unusual in this vicinity. Thunderheads will develop over the mountains 20 miles, or more, to the north, or even further away to the east. Storm cells often form and pass through Temecula, Lake Elsinore, and out near Baker and Needles. They very rarely pass over the Fontana/Rialto/Rancho Cucamonga area. But, this last week we had two days where storms passed right over us, drenching the yard with .07 inches of precipitation. Oh, frabjous day! Callooh! Callay! Then, we had four or five days of heat with temperatures over 100. Ugh. I’m so done with the heat. It’s hell on the younger plants and I’m forced to water, even when I don’t want to. My current plan is to water only the youngest plants that were installed this last Fall every other day. Once exception is my Gambel Oak tree. It isn’t a California Native, but rather is from the Utah/Colorado area. It’s drought tolerant once established but it’s used to much more rain than we get normally here. Well, for that matter, my other two oak trees also usually grow in areas that get more rain, too. So, I have been watering the Gambel about three times a week and watering deeply. The Chrysolepis oak and the Wislenzeni oak both are being watered deeply once per week. Lo! And Behold! The Wislenzeni (aka Interior Live Oak) has sprouted new growth of several inches on multiple branches. The Canyon Live Oak (Chrysolepis) also typically gets much more rain but it has not sprouted new growth much recently. It’s sleeping, I guess. Quercus wislenzeni (Interior Live Oak) getting some water. Then, once per week, because it is so hot, I’m spraying the plants down and watering the older plants, too. Well, not the ceanothus plants. They get sprayed but not watered. They hate water, apparently. The other thing I’m doing is trying to confuse the gophers. I have at least one gopher active in the yard right now. I want to catch him but it has been too hot and I’ve been too tired from work to get in the garden and dig so I can set traps. I think that the gophers are attracted by the water in the soil. So, when I water just the foot or two around a plant, it tells the gopher where the tasty roots are. So, instead, I’m watering much more broadly. The mulch is doing a pretty good job of limiting the weeds so I can water more areas in the yard. This way the soil is wet in a lot of places, not just where the new plants are. It seems to work somewhat. Last year gophers would dig up right where the young plants were, killing them. But, this year I’ve seen gopher mounds where there were no plants at all. But, I’ve still lost five or six plants to the heat/gophers. Two ceonothus plants are dead and three monkey flowers plus a couple penstemons. I don’t like that. But, maybe that’s just how it goes in a garden. I once counted over 120 plants in my yard, not counting the vegetables in the raised beds. In that case, less than 1% of my plants died. I guess that’s pretty good. I’m still done with all of this heat, though. Native Plants… So Hot Right Now! The story of July so far is heat. My Acurite Pro 5-in-1 Weather Center has been recording the temperatures. 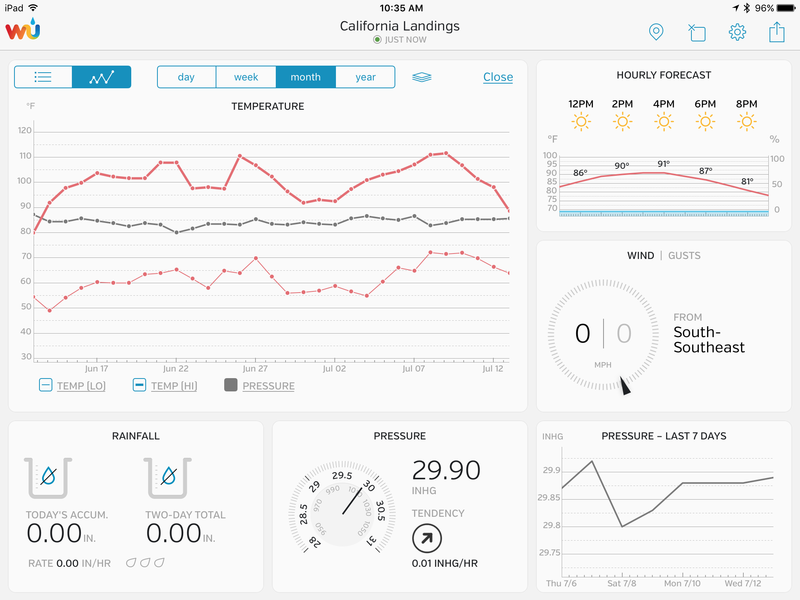 Here’s a screenshot from my Wunderground weather station app. The temperature chart (upper left square) shows the high (top line), the middle line is the barometric pressure, and the bottom line is the low temperature for the day. The temperature chart shows the daily highs and lows from June 12 through July 12. A month ago, June 14, the high was 92 and the low was 49. That’s a big difference from July 9 when it hit 112 degrees and the low was 72. From what I understand, the really brutal part of summer for my plants is the night time when it really never cools off enough for them. My vegetables, especially, seem to be suffering. I’ve got a drip irrigation system on them now, so they are getting the moisture they need. But, the heat seems to be affecting their production of fruit. My native plants are adapted to the heat. Many of them go dormant in the summer. While there is variation among the plants, the cycle seems to be that they conserve energy during the summer. Water is pretty scarce so they survive instead of thrive. But, when the temperatures cool down in the fall, they prepare to grow and by the late winter, most California native plants are blooming and growing. For example, my desert willow trees drop all of their leaves during the winter and look dead. But, if you look, there are buds on the branches. When the weather warms, the tree sprouts leaves and grows. The summer is about flowers, seeds, and survival. A few plants, however, especially the younger plants, are still growing! I’ve seen new leaves on some of my manzanita. The white sages’ flowers are all but gone, now, their “wands” browning and ready to drop seeds, but they are sprouting some new leaves, too. But, the biggest story of growth this spring/summer has been my Gambel Oak! You may be able to tell in the picture above, the two branches that are tallest are completely new growth just this season. Both of them represent two or more feet of new growth! It’s a big jump for a plant that heretofore has only shown inches of new growth in the past couple of seasons. 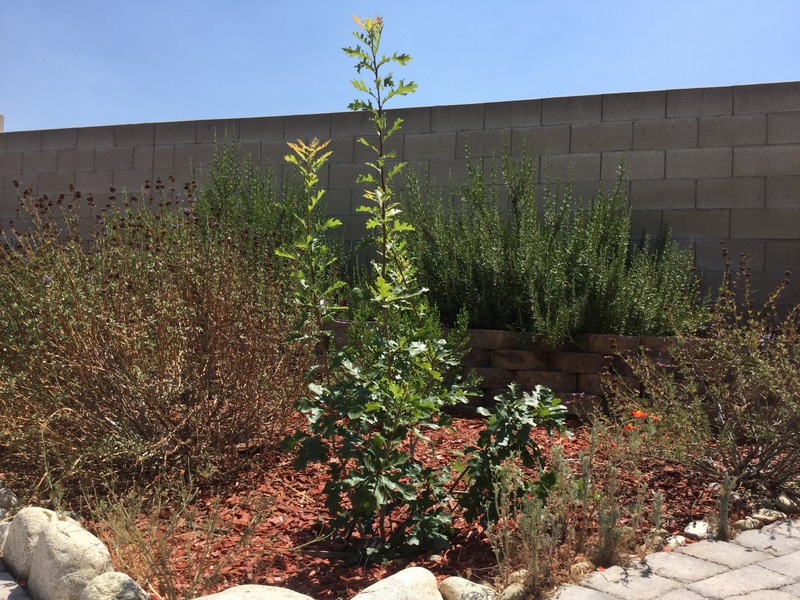 I have been told that there is a saying among gardeners that “first they sleep, then they creep, then they leap.” This Gambel Oak was planted back in June of 2015, one of the first plants I actually put in the yard. So, in all, it was two years ago, but it feels longer. Patience is important, I guess, with gardening, but it’s hard to cultivate that, pun intended. The heat has been brutal but looks to be letting up a little. Yesterday it hit 101 but today is suppposed to stay in the upper 90’s and the same is predicted for the rest of week. But, we had multiple days of scorching heat, over 15 with temperatures topping 100 degrees. The heat makes watering difficult. California natives don’t like water in the summer time, mostly. While I’m far from an expert on such things, my understanding is that the native plants have adapted to the heat and the nutrient-poor soil by working with microbial organisms in the soil. These bacteria live on the roots of the plants and they fix nitrogen, I believe, that the plants then take in. The bacteria thrive when soil is cool and moist or warm and dry. But, they don’t like warm, moist soil. Too much moisture in the warm soil kills California native plants and some are more sensitive than others. Do not overwater. In most of the state, summer water wreaks havoc with life underground. Not only does overwatering in the warmth of the summer promote the growth of fungal pathogens that lead to root rot and crown rot, it also harms beneficial fungi that link to their roots and enable them to take in nutrients and water efficiently. These links, called mycorrhizal links, enable the plants to ward off diseases, help them recover from drought, and improve the structure of the soil. The mycorrhizae exist in mature native gardens but they take time to develop in transitional gardens. Overwatering (or overfertilizing) disrupts the establishment of these unseen important relationships. I try to follow the advice. But, we have had multiple heat waves over the last few weeks. I started this post a week ago and the heat is still hitting 100 every couple days and when it doesn’t, it’s still in the high 90’s. And it has been very dry. It feels better to us for the humidity to be low, but plants need some water. So, even though I think I shouldn’t, I feel like I should go out there and water. Your humble author, making it rain up in the garden. The thing is that many California native plants need a couple years of water before you can let them be during the summer. In a couple years my backyard should need little to no water at all. Only when I plant something new will I need to go out and actually water. 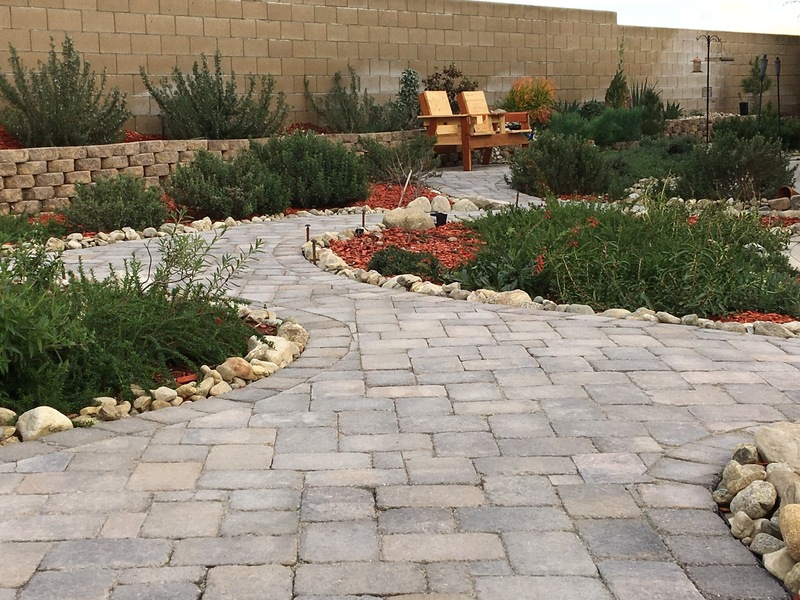 The website for the Las Pilitas Nursery is another treasure trove of information for California native plants and the author, Bert Wilson (now deceased), recommends spraying native plants to rinse off dust, but otherwise, not to water them. That’s what I try to do. But, some of my plants are still very young while others are close to being “established” in the yard, meaning their roots are developed and extensive enough to support the plant through heat and drought with minimal assistance. The worst part, for me, is that I lose some plants anyway. My sticky monkey flowers always seem to brown and die in the heat. I’ve lost four of them this summer and several last summer. And the sages can sometimes wilt and die back in the heat. The worst hit has been my vegetables. My pumpkin plant stopped producing fruit after one pumpkin, as did my butternut squash plant. The zucchini vines withered and the tomato plants are struggling. And, another issue related to this is that the wet soil attracts gophers. So, I had started watering more broadly over larger areas to try and confuse the gophers as to where the roots are, since I’ve had a lot of plants killed by the awful rodents. Weather West, one of my favorite blogs says we should expect continuing hot weather of much the same intensity but with more humidity over the next week to ten days. Has the summer brought any challenges to your garden? Lost any plants? Has it been unusually hot where you are, too? Feel free to add a comment! Wind! Good God, Y’all! What Is It Good For? My least favorite weather event by far. Wind. I hate it. I’m not talking about a breeze, a gentle stirring of the leaves. Nor do I refer to wind that is good for kite-flying and refreshes the atmospheric conditions. No, I speak here of gusting, tearing wind. Wind that blows and batters and blasts the land, the trees, and all that stands in its path. 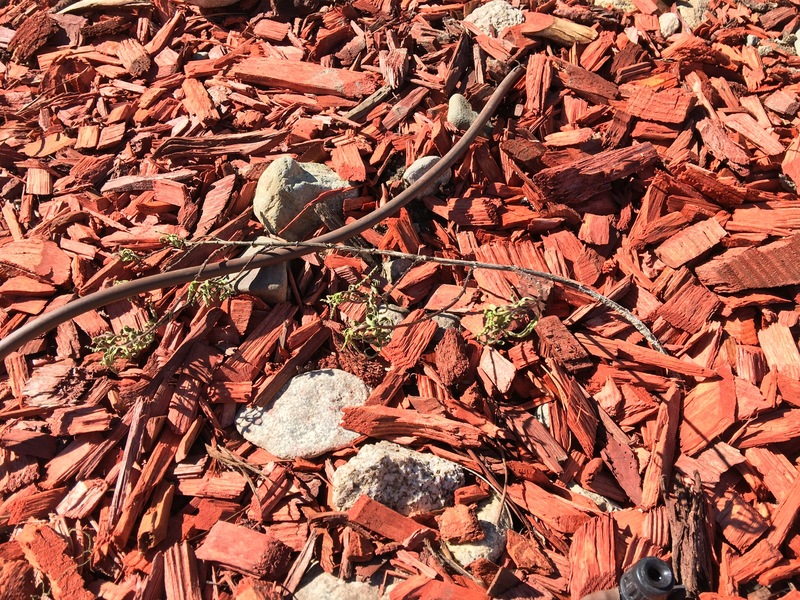 Here in the sun-kissed Inland Empire, we get a hefty helping of this wind. I know, it’s my fault for buying a house below the Cajón Pass. Said geographical feature acts as a wind tunnel, it seems providing a natural easement between the great Mojave Desert that abuts the San Bernardino and San Gabriel mountains and the Inland Region that leads to the California Coast. This easement is the path of least resistance when there is a pressure difference between those areas. If an area of low pressure sets up off the coast, and high pressure is situated in the desert, then wind will rush through the Pass and eventually over my yard on its way to freedom over the ocean. Like a young child let out of school for the summer, the wind breaks headlong toward, with speed and heedless of anything between it and its desired destination. This rough passage has an impact of no small import on my landscape. As I walked around my yard, I find that where I used to have 1-3 inches of mulch (red bark, mostly), there is now bare ground. 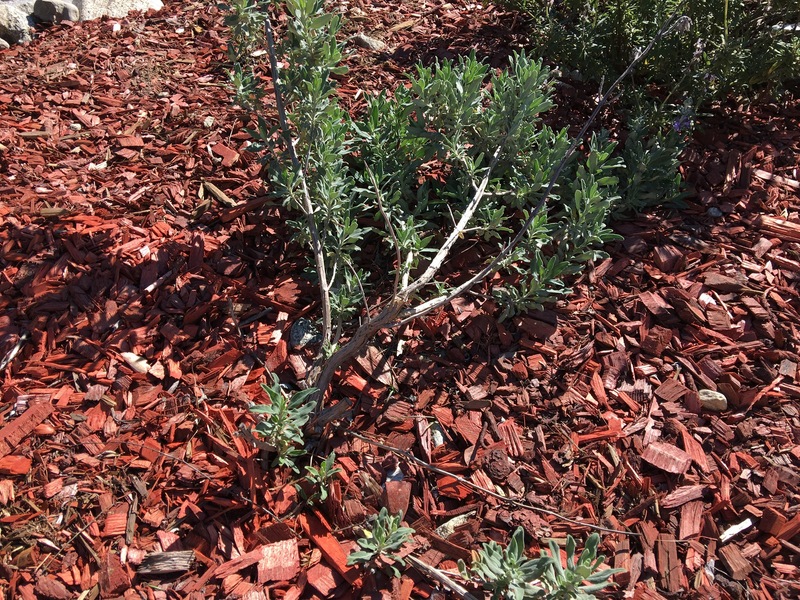 The aforementioned mulch is gathered in places I wish it was not, such as the base of my young Cleveland sage, which now has 4-6 inches surrounding it. The wind breaks some of the branches of my plants. A couple were entirely snapped off of their main trunk, effectively killing the plant. I believe I lost today a penstemon, a milkweed, and a monkey flower. I saw one of my Chickering Cleveland sage lost a major branch, too. Bare ground showing after wind blew the mulch away. Allen Chickering Cleveland sage with broken branches courtesy the @&$#%! wind! Poor baby milkweed plant desiccated and thrashed by the wind. Besides doing physical damage thusly, the wind is also dry. Very dry. The humidity today is currently 15% and dropped as low as 12% yesterday. My understanding is that this dry air has a desiccating effect on the plants, in some cases wicking moisture from the leaves and branches, not to mention from the ground. 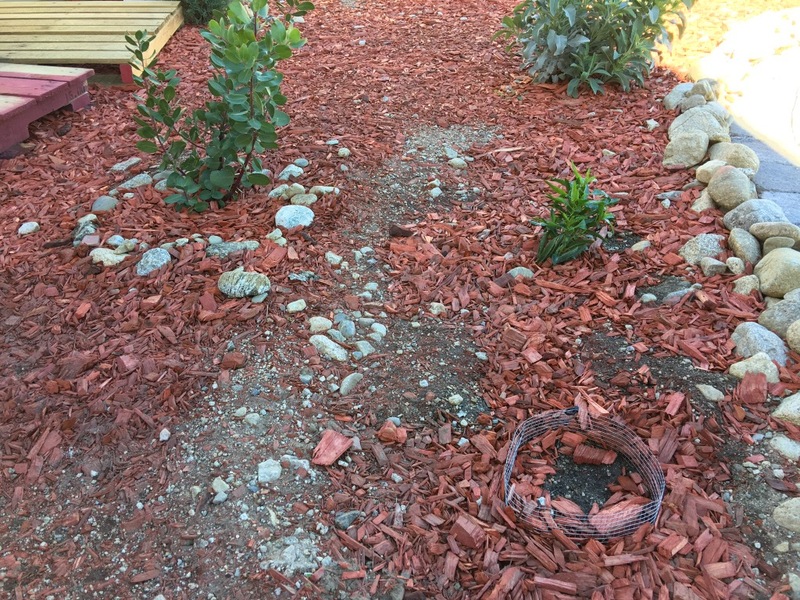 Ideally, mulch should mitigate this, but not if the wind manages to blow that mulch aside. 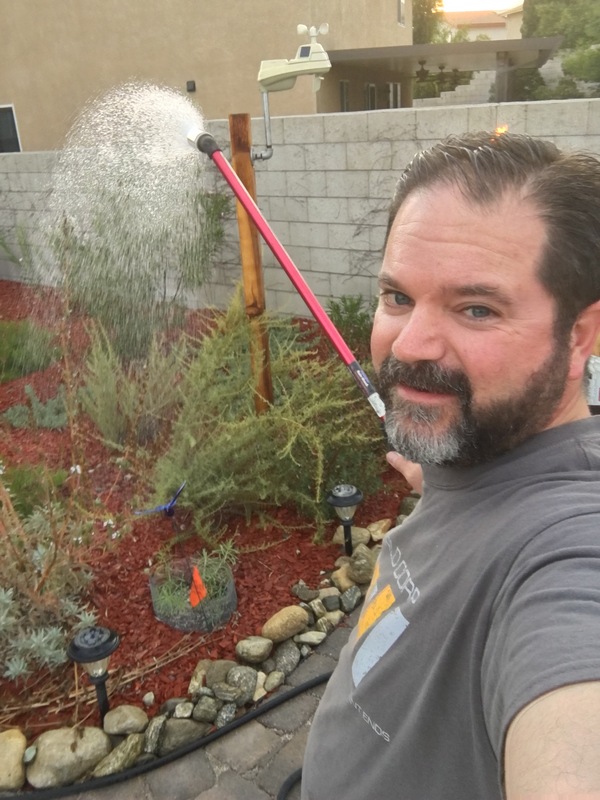 So, even though we just got weeks of rain and that brought 11 inches to the ground, I still had to go out and water my plants. Dry, young plants are less supple and weaker, more prone to breaking off. Their leaves shrivel as the dry air blows across them. 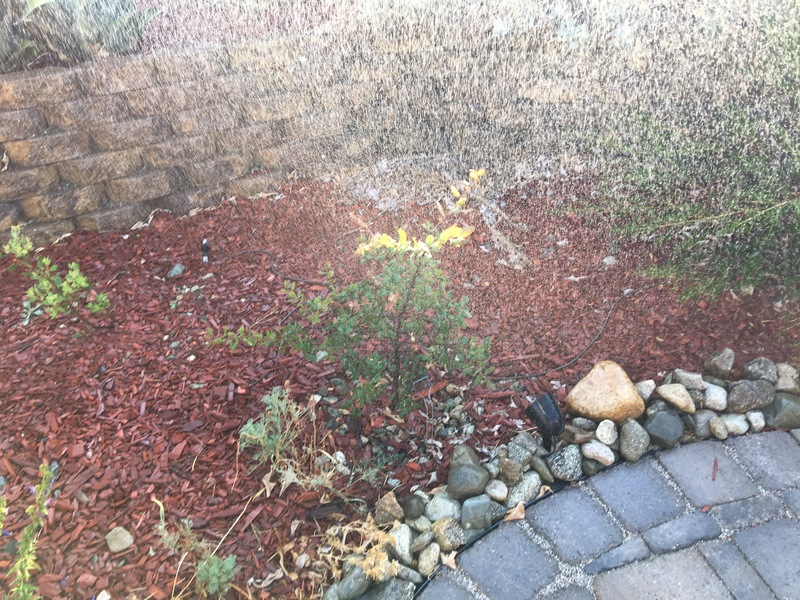 Some of the plants, like manzanita, have leaves that don’t lose as much water. But, for the younger plants just installed this last season, I have to water them, too. Rain, at least, will give us much needed moisture. Cold and hot temperatures give the plants a sense of season, reminding them to grow, to sleep, to flower, etc. But, wind? Wind doesn’t offer me anything. It makes a mess. It blows trash into my yard, moves furniture, knocks over containers and as I mentioned before, scatters my mulch. And, listen, lest you, dear reader, get the misconception that I’m airing a grievience over a brief event, an occurrence that is evanescent in nature and I ought to simply hush. Well, please find it in your heart to understand that this wind has been blowing since Thursday. That’s four straight days of wind averaging 13 mph. That’s the average. And, I just checked, we’ve averaged 13 mph for the entire month! We had wind like this in the middle of the month, too. My weather station recorded a high wind speed of 20 mph January 14th. Yesterday, we had a gusting wind that hit 22 mph. Imagine getting the plants in your yard, putting them in pots, then strapping them to the roof of your car and driving around for four days around the streets of your neighborhood. You drive the whole time, too. Vary your speed if you like, but average about 15 mph and that’s what is going on with the plants in my yard. Four days. This wind is forecasted to blow through the night and into tomorrow morning, but it is supposed to, at least, begin to subside and be a much more manageable 5-10mph. Still, I hate this wind. There’s just no good from it, to me. Dry no longer: drought broken, or just at bay? My region of Southern California is often dry. Total days of rain are usually few, less than 30, I’d say. Additionally, inches of rain average between 10 and 15. But, in the last several years, California, and here specifically, has been in the grip of severe drought. I estimate that we got something like 6 inches of rain all year last year (by which, I mean, the “rainfall year” which typically is said to begin in October. This month alone we have doubled that. In January, my weather station (which is probably fairly acurate but not necessarily precise) has received nearly 12 inches, and will most likely exceed that today. I’ve become much more aware of the weather and rainfall since starting my garden/yard. The majority of my plants are drought tolerant. They still need water and in times of drought, they need supplementary irrigation. But, I think I may not be watering much this Spring. In fact, more than half of my plants have been in the yard over a year. My understanding is that after a year, California native plants are “established” and need significantly less water. For some, that means none. There’s a great site, Las Pilitas, that is primarily a nursery but is also a treasure trove of information about California native plants. 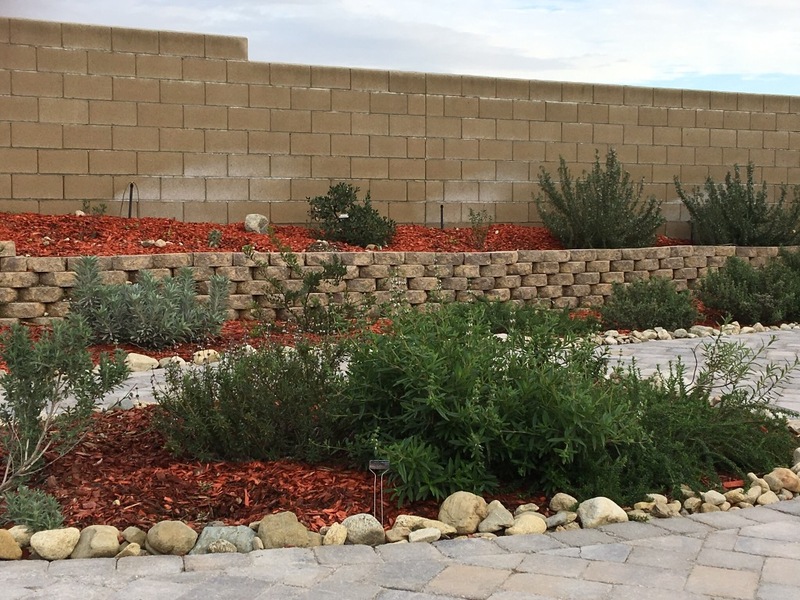 On that site, they specifically state that most truly drought tolerant California native plants hate water after the first season or two. 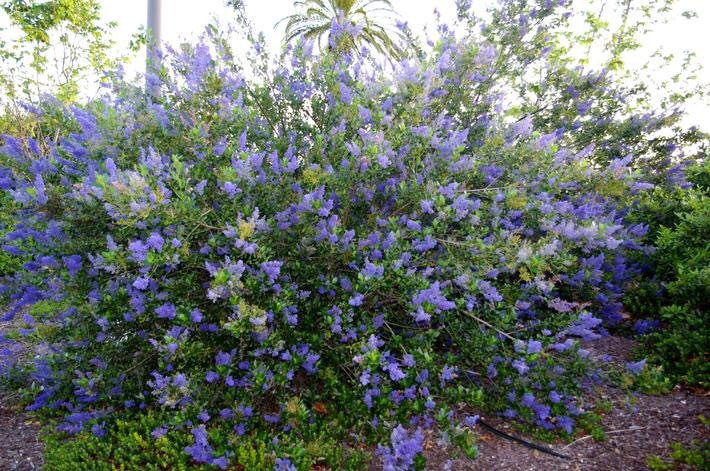 For example, I have a few different Ceonothus species. These are also known as California Lilacs. Ceonothus plants, as far as I can tell, hate water, especially when it’s warm. They will accept water when it’s cold, like right now, but that’s it. What I have read is that there are microorganisms in the soil that live when it is either cool and moist or warm and dry. Warm and moist soil kill these microorganisms. They are what provide nutrients to the roots of many native plants! This is why, by the way, you also should not amend California soils when planting natives, and do not add fertilizer. Apparently these mycorrhizae feed the plants are vital for their growth and survival. You might say that if you are a gardener of California natives, you aren’t growing the plants so much as these mycorrhizae! So, I have killed at least two Ceonothus plants by watering them too much. I’m doing better with the ones I have right now. I have four that have been in my garden over a year now. Two others were growing and looking good but they were eaten by gophers. Speaking of, I just read as I was getting links for this post, that gophers tend not to eat plants that aren’t being watered!!! Oh yeah! So, maybe this year will be better if I’m not watering so much, then maybe the gophers won’t eat so many. That doesn’t mean my hose will be idle. About once per week, I will go out and “wash” the dust off the plants by spraying the leaves. This won’t really water them but it will keep them from getting covered in dust, something else they hate. That will be nice to just go spray my plants down and not worry about watering deeply. Let’s be clear, though, this only applies to established plants. For the plants that are still young and in the first season, I will definitely be watering those plants (and keeping an eye out for gophers!). The rain coming down right now as I write this means I will probably not water any of these established plants at all this Spring. We’re having a good year for rain, even by California’s standards. It looks like we will at least meet the “normal” averages for rain and that should make my garden very happy. Since finishing the paver patio/pathway, I’ve been resting a bit. I get back pain due to a bad S-I joint. It’s been nice to rest and maybe just stroll around the garden a bit, but I’m also thinking about the next thing. The south side of my yard is small, gets some shade, and I’m planning to put in vegetables, fruit trees, and herbs. I have two raised garden beds ready to go and plan on maybe a third. The area needs some work, though. There’s a lot of soil that was removed from the front yard when we put in some additional concrete for parking. And, the retaining wall I installed needs another 15 feet to really be finished. My idea is to bring the wall over and curve it a bit, similar to how I have it on the north side. That will give a slightly raised area. Then, I will try to level the rest of the area and plant lime, orange, and avocado trees, one each. I have some heirloom seeds on order for vegetables and herbs. And, of course, I’ve never really done gardening like this before. I had a tomato plant in 2015 that never really made it through the summer. I’m guessing I didn’t give it enough nutrients in the soil. But, I plan to have the beds have much better soil and fertilizer. They have hardware cloth across the bottom so that should keep at least the gophers out. Rain has been much better this year than last. I remember going all of December with no rain. This year we’ve had over 5 inches since October! Most of it came in the last week of December. That’s great for my garden. I’m very interested to see what happens with my California native plants. I have California Buckwheat, manzanita, and sage that have been in the yard over a year now. My understanding is that after the first full year, the plants are usually established in the garden and they require little to no water. In November I attended a workshop at the Rancho Santa Ana Botanical Garden nursery, called Grow Native. They sell, as far as I know, only California native plants. Anyway, one of the workers, a young guy who is studying native plants in school and sounds like he has a lot of experience gardening/landscaping, gave a workshop on planting and watering. To summarize, you did a hole twice and wide and 1.5 times as deep as the pot the plant is in. Then, you fill the hole with water, let it drain, then fill it with water again, same. Then, install the plant with the base of the plant about an inch higher than the surrounding soil, then water it again. Most of my plants seem to be doing well at the moment. I’m seeing some new leaves growing on the manzanitas and sages.